Chance Eau Fraiche rounds off the line of Chanel’s Chance flankers (at the time of this writing). It’s the first flanker to the original, meant to be a lighter, younger, interpretation of Chance. Though Chance was young to begin with. In Bottle: Light, crisp and green. Very clean and citrus heavy topper with a sweet fruit-like note lingering around as well. Applied: Sweet, after the sharp citrus kick that immediately invades the nose upon application. The citron is going bananas in this fragrance as Chance Eau Fraiche mellows a teensy bit in the mid-stage but still clings to its sharp, clean, blaring personality that it displayed on initial application. I don’t know how to calm her down but she is very energetic! The middle has that sweet fruity note again and a familiar hyacinth echo that was present in the original Chance. It’s pretty much a cleaner, lighter, more citrusy Chance and there isn’t a whole lot else to it. The mid-stage is rather disappointing this miasma of sharp, sweet and clean that doesn’t quite go well together but tries anyway. The drydown is a mildly woodsy white musk. Like faintly wood-scented soap and sweet lemon drops. Extra: Eau Fraiche is good for the young audience too though it is definitely a flanker and isn’t likely to excel much beyond that. It’s got clear echos of the original Chance except even cleaner, even more sheer and slapped in the face with a dollop of fresh. 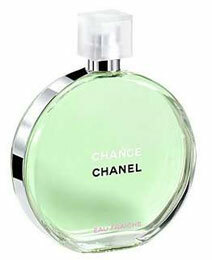 Design: Much like Chance and Chance Eau Tendre, Chanel Chance Eau Fraiche is bottled in a circle with a square cap. Same effective deal with the same minimal but attractive Chanel elegance. Eau Fraiche’s juice is colored light green. Notes: Citron, water hyacinth, jasmine, white musk, vetiver, amber, patchouli, teak wood. Ranking the Chance series, I’m going to have to put original Chance in number one, Eau Fraiche in second and Eau Tendre in third. Mostly Eau Tendre suffers because of how familiar it is to Marc Jacobs Daisy on the opener. Reviewed in This Post: Chance Eau Fraiche, 2010, Eau de Toilette. This entry was posted in chanel, floral, fresh, Reviews By House and tagged amber, citron, jasmine, patchouli, teak wood, vetiver, water hyacinth, white musk. Bookmark the permalink.